With the SEC's announcement of Georgia Tech alumni (sic) Bobby Gaston's retirement as head of SEC officials, the Georgia Sports Blog would like to recommend some other candidates to continue Gaston's legacy of giving Georgia Football the one-eyed stiffy at any chance they get. -- Joe Hamilton - Former Tech player associate (NCAA vacated his athlete status) who hates Georgia. Also has a long track record of cheating as documented by the NCAA. Is young enough to serve in this capacity for the next 40-50 years. -- Kelly Rhino - He does everything else for Tech, and won't take up much space in the league office. -- Phil Fulmer - He's been running the officials for years behind the scenes, so it would just be official. He already runs the SEC Compliance office. Why not officiating too? Wouldn't you hate having a game stolen from you with the complicity of the SEC league office and a massive institutional scheme to "engineer" eligibility for otherwise ineligible players? And, UGA did not lose that game. The results were vacated because Tech lied and cheated. 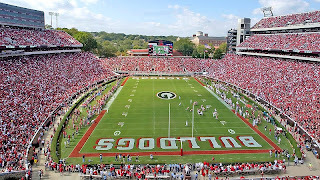 What is pathetic is that it takes the participation of so many non-players to even make Tech competitive against UGA. Tech: Now 6 years into their 3rd century of cheating to try to beat UGA. oh, anonymous, you wacky nerd. We dont hate that we lost to Joe "Webster" Hamilton. Haven't you seen the recent NCAA report on GTU's lying and cheating? You pencil necks haven't beaten us since Shawn Jones was manning the controls over there back in what seems to be about 1958. By the way, since you brought up ol' Webster, perhaps you'd be good enough to explain how a guy that was academically ineligible for THREE YEARS IN A ROW (per the NCAA) managed to keep suiting up. For a bastion of haughty, self-aggrandizing integrity, you nerds sure seem to do a lot of backpeddling about the "unfortunate series of events" that led you to NCAA jail. It's instructive that no one over there has the good sense to be embarassed by the lying and cheating (rather than pissed that you got caught), or the good sportsmanship to admit that the Jasper Sanks "fumble" (sic) was the single worst call in the history of the NCAA. Count on one of you spineless weasels to be gloating about a game the refs stole for you while you used academically ineligible stars to win, though. WTF? The SEC hates us. The AJC is reporting that another Tech grad, Roger Redding, will replace Gaston. We should be very careful since the next likely chief of officials is Reggie Ball, naturally talented in throwing a penalty flag since most of what he throws hits the ground, he reaaallly does hate UGA, and he certainly expresses that hate on the field. Dawgnoxious and all school hit the nail on the head. Maybe instead of trying to come up with desperate rationalizations why UGA is a bunch of cheaters while Tech was merely the victims of some unfortunate luck, the Techies out there would be better served by trying to figure out how they used all those ineligible athletes for so many years and still only managed to go 3-4 against UGA during that time. What that says to me is that Tech isn't even particularly good at cheating, much less football . . . but if anonymous #1 has a different take on the subject, I'd be glad to hear it. I can understand the need to go get a guy from a school outside the conference, so that there is no bias towards one school, but WTH! There are 105 schools to choose from why do they keep picking UGA's in state rival? Maybe the SEC really does hate UGA.